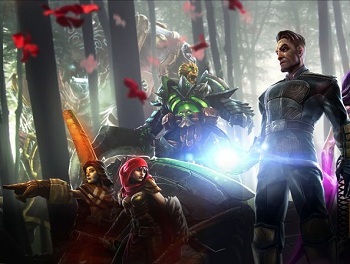 A new MOBA hopes to shake things up with "ever-evolving, community-driven content and story." Once upon a time, everyone had to make an MMO to chase after the World of Warcraft cash cow. However, the massive costs involved in actually making a AAA-quality MMO rarely resulted in Blizzard-levels of cash. Today, the games to make are MOBAs. After seeing the resounding success of League of Legend and the technically-still-beta Dota 2, it seems that every other game company has some sort of MOBA in the pipeline, EA included. While the rumors whispered of a F2P MOBA from Dead Space devs Visceral Games, Dawngate is coming courtesy of the fresh faces at Waystone Games. Both Waystone and Dawngate are so new that its forums aren't even functional yet. There's not much to go on at this point besides the tiny blurb on the website. Said blurb states that Dawngate will be "built from the ground up to look and feel familiar". That may not sound exciting, but the MOBA genre is pretty well entrenched with the very explicit Dota formula. However, the "forge the champions you love for the roles you want" and "ever-evolving, community-driven content and story" bits do sound interesting, as neither items are found in the ancient Dota recipe. Interested parties can throw their hat into the ring for a shot at the closed beta here. When the the beta begins and the target launch date are currently unannounced.